Nina Beveridge was born in Mumbai, India. Her Canadian parents James and Margaret Beveridge moved to India in the 1950’s to participate in shaping the country’s new identity through the use of documentary film. Modelled after Canada’s NFB where her parents met and honed their craft, Nina’s father at one point was the Commissioner of the India Films Division. Their passion for India continued to lure them back throughout their long careers in documentary film and academics. 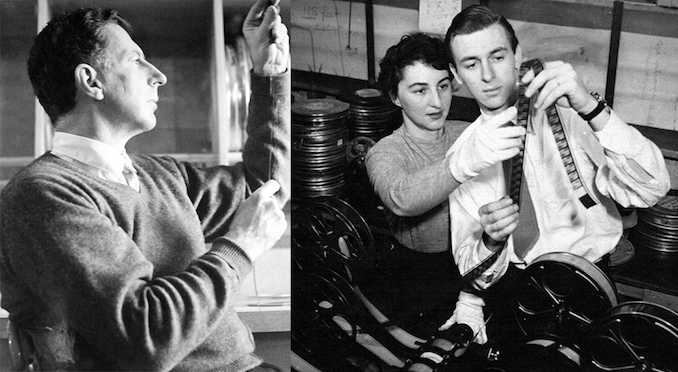 Documentary pioneers James and Margaret Beveridge. James as Commissioner of the North Carolina State Film Board and Margaret as Editor-in-Chief at the NFB. Although Nina left India at a young age she returned as a teenager to study first at Woodstock School in Mussoorie and then later to study fine arts at MSU in Baroda. Having already lived in various parts of the USA and Canada, Nina’s wanderlust took hold. She travelled extensively through India, Iran, trekked to Everest Base Camp and backpacked across Europe. She eventually returned to Canada and got an Honours BA in English and Philosophy from Glendon College. Nina Beveridge in India. Left: in a Gujarati folk dress at Lodhi Gardens in New Delhi. 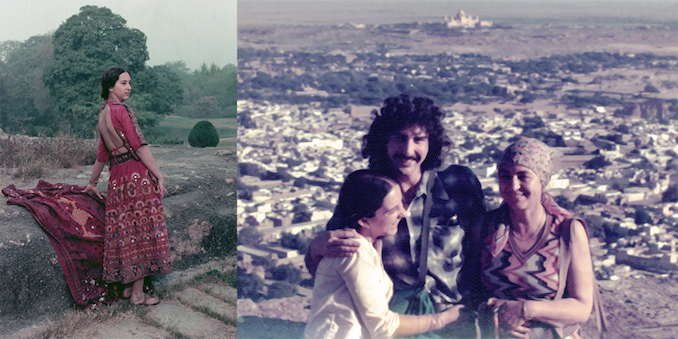 Right: with brother Alex and mother in Rajasthan, India. I first became friends with Nina in Barcelona while working on CTV’s coverage of the ’92 Olympics. 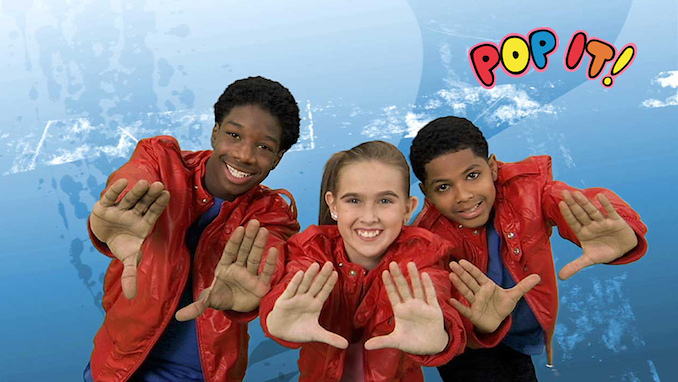 Nina was the graphics director and was in charge of the design and implementation of their on-air look. Two years later we found ourselves doing the same thing in Lillehammer, Norway for the ’94 Olympic games. By now a well respected creative director Nina launched Beevision Productions, which I would later join as a partner to run a full service post-production and animation company specializing in broadcast design. 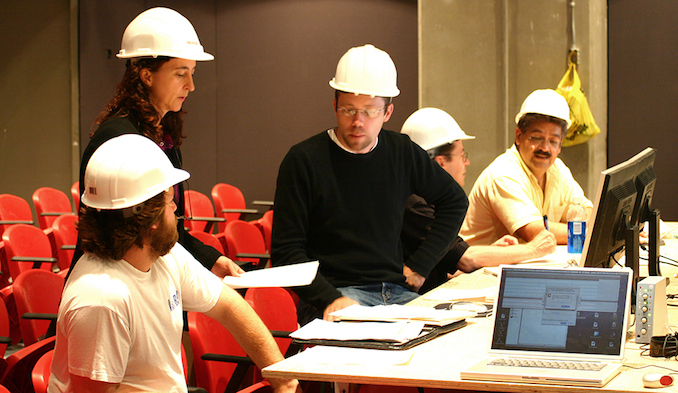 Although we were a creative service company with high profile clients such as The Raptors, CTV and CBC, our goal was to produce our own projects. In 2005 Nina was commissioned by TVO to direct and produce our first independent feature length documentary, “The Idealist: James Beveridge, Film Guru.” This poignant POV doc about her parents’ life as documentary pioneers was filmed in Canada, the USA and India. I did location sound and edited the film. My favourite screening and Q&A of this award winning film was on Father’s Day at the National Gallery of Art in Washington D.C.
We have been privileged to make several multi-platform documentaries with various partners since then. We co-own Hop To It Productions with Susan Nation and Nina partnered with Liz Marshall to produce “The Ghosts In Our Machine.” Her expertise in producing, web design and community building for documentary films keep her in high demand and busy beyond words. 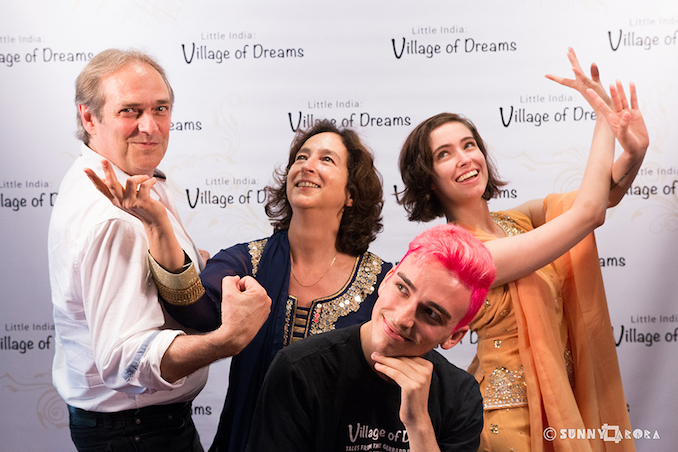 The Hart – Beveridge family at the “Little India: Village of Dreams” premiere. Left to right: Paul, Nina, Liam and Jamie. I live in the Upper Beach, Toronto, just two blocks from Little India. We’ve lived here since 1997 and my partner Paul and I raised our two kids here. Our daughter Jamie is now 22 and our son Liam just turned 19. I love this area. A while ago I decided to adopt a rescue dog. His name is Rocky and he is from Qatar, by way of Washington, DC where I drove to pick him up. Since then I have discovered what a beautiful, green neighbourhood we live in. 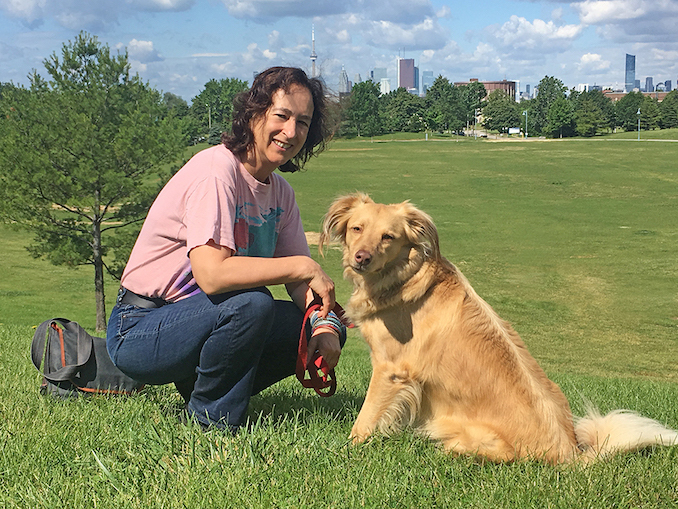 Rocky, Paul and I explore the parks, ravines, beaches and residential streets every day. It’s been an opportunity to reconnect with nature. When I was a kid we lived for three years in the Laurentians, and later on for two years in Aylmer, Quebec and I spent most of my time in those places exploring the woods, ponds and fields. I love exploring all the little nooks and crannies where you can find and reconnect with nature here in this city. I feel very rooted to Indian culture. My favourite escape is to hide out over at Udupi Palace and sip chai and snack on idli sambar while I work on my computer. The veggie samosas at Moti Mahal are second to none, it’s hard to walk by there without picking some up. Bringing our kids up and running a production studio at the same time was intense, so I didn’t get to spend much time in Little India but I saw it changing over the years and I wanted to know more. 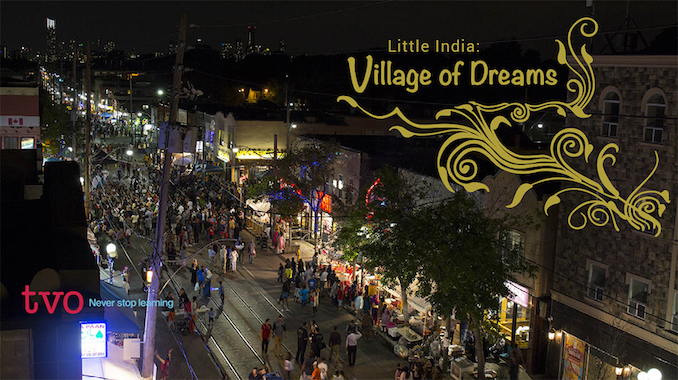 When TVO announced they were seeking proposals for documentaries that reflected upon our evolving Canadian identity with a focus on diversity, I knew I had to pitch what became our latest project – Little India: Village of Dreams / www.villageofdreams.ca. Now I love walking down the street and knowing the faces and stories of so many of the business owners there. I’ve made many new friends. The project was incredibly fulfilling as it allowed me to reconnect with my Indian roots and to become a part of a complex, culturally rich and dynamic community while I pursued my art. Nina Beveridge with a few of the wonderful women she filmed with from Gerrard India Bazaar (Little India). I am a filmmaker and a designer. I love the people and creative processes around both modes of expression. I’m definitely an indie – I’m a producer / project manager and I’ve been running my own business since 1993 and I freelanced before that. I love the shift towards multi-platform/trans-media storytelling as it challenges me to combine my creative skills in one project. I’ve always been intrigued by experimenting and working with new technologies. My partner Paul is a lot like me. 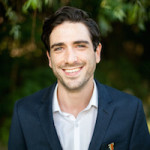 He edits, directs and animates, and he also works on our films as a sound recordist. Our production company is named Beevision and we pitch and produce our own content as well as do service work. Our studio is now home based, and its a great way to work. Nina Beveridge with the Sound Dogs team and Mixer Stephen Harper, working on the 10.1 sound mix for “The Calling”, a film about what it feels like to be at the Olympics, at Olympic Spirit Toronto. When I’m not working or walking Rocky the dog I love to swim. I have been swimming in the mornings with the same group for ten years now. I used to compete in high school and this past spring I went to my first swim meet in a very long time. It was fun – it was an all-day event held in the Pan AM pool in Markham. I like to practice yoga and take other fitness classes and I love gardening. The exercise and the dog walking balances out the intensity of my work, the deadlines can be stressful and sometimes the days are very long, but I always manage to find something positive to appreciate as the day goes by. Before I had children or a business to run, I was an ardent traveller. Rather than ‘vacationing’ I preferred to save up my time and money and go away for longer journeys where I could really explore and immerse myself in a culture. Filmmaking is another way to travel, even if it is right here at home. It gives you the chance to step out of your own world and into the world of another person, family or culture. Walking with Rocky, Woodbine Park. 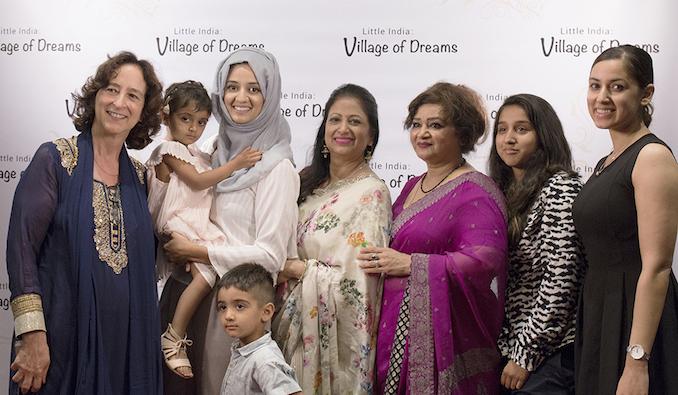 Our latest project is a documentary film, website and social media project called Little India: Village of Dreams, now entering the release phase. 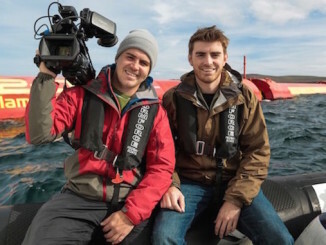 The one hour documentary premieres on TVO on July 1st and we also have a 70 min. festival version. Currently we are focussing on editing over twenty web shorts to complement the film to be released on www.villageofdreams.ca. I wanted our project to be more extensive than what you can fit into a one hour film. Each web short focusses on a different business owner in Little India and reflects upon topics including their origins, religion, culture, hopes and dreams. There are many unique people and nationalities to be found in the Bazaar and we are really looking forward to sharing their stories. Over the summer we’ll be blogging about the characters in the web docs and the film, to add yet another layer of content around the stories. At the 2017 Festival of South Asia on July 22-23, we’ll be awarding two prizes for the winners of our “What’s Your Bazaar Memory?” Contest – a photo and non-fiction story telling contest. This was another arm of our cross platform documentary project, what I would call the ‘social’ arm, but it’s also an exercise in gathering and archiving history. 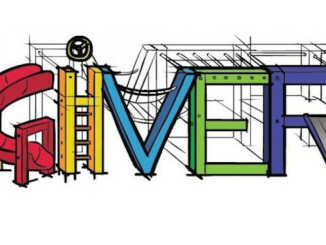 The City of Toronto Archives and the Gerrard/Ashdale Library partnered with us in this venture. Little India exploded into the scene in 1974 and has continued to transform over the forty plus years of its existence. These days the talk is of gentrification, and whether its a good or bad thing. Most merchants on the street would tell you gentrification is a good thing. It’s important for the community to thrive as a whole, and to continue to bring in new business. While making this film we thought a lot about how Toronto’s many ethnic villages are evolving. What’s happening in Little India is happening all over Toronto. Immigrant cluster communities formed out of the need to share a common language and culture, as they navigated their way through a new country and raised their families. As these new Canadians took root and learned the language and culture, and as their children grew up Canadian, they began to let go of their culture of origin. 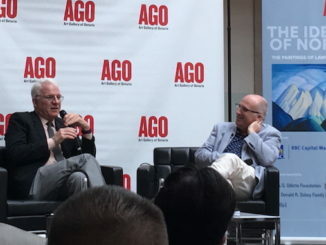 I see it as a positive, because it is inevitable, and what we need to do here in Toronto is allow for a graceful transition to happen in these communities without losing the culture entirely. Our website www.beevision.com has a good archive of our work over the years. Recently I have had the opportunity to do web design and campaign management for some fantastic docs. I was recently collaborating with Anne Pick and Bill Spahic from Real to Reel on www.thalidomidestory.com, the website companion to a film by John Zaritzky about Thalidomide survivors called “No Limits”, his third film on the topic. The website is a multimedia resource that reveals the tragic effects of the drug worldwide and the callous tactics employed by international pharmaceutical and drug distribution companies in the pursuit of profit. My previous project, also with Real to Reel, was to design www.eccentrics.ca, a website for another John Zaritzky film that explored eccentricity called “A Different Drummer”. It was fun because our mission was to be whacky yet professional. A third digital design project I really enjoyed being a part of was The Messenger. I worked with Producer Joanne Jackson and Director Su Rynard to manage an indiegogo campaign and build out their website www.TheMessengerDoc.com in support of this very important and lyrical film about the decline in the population of migrating songbirds. Lastly, I’ll mention a project I am proud to be associated with. I co produced the website and documentary film “The Ghosts In Our Machine” / www.theghostsinourmachine.com, directed and co produced by filmmaker Liz Marshall. It was a labour of love that I worked on with Liz from 2011 through to 2014. The film and website were constructed around a moral question, “Are non-human animals property to be owned and used, or are they sentient beings deserving of rights?” It turned me into a vegetarian. Our entire household’s animal product consumption has significantly reduced since my eyes were opened by the talented animal rights activist and photographer Jo-Anne McArthur, the human subject of our film.